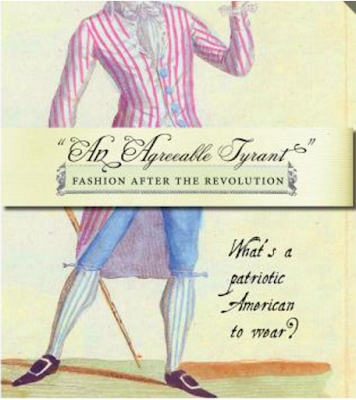 I ordered "An Agreeable Tyrant": Fashion after the Revolution the moment that Alden O'Brien posted about its availability on Facebook. The eponymous exhibition opened this month at the Daughters of the American Revolution Museum in Washington, D.C. and will run until April 2017: it focuses on American men's and women's dress from the end of the Revolutionary War to 1830. And you really want its catalogue! Not only does it have beautiful photography of the exhibition, it features a number of well-cited essays on the period that are great reading. The book opens with "After the Revolution: Aspirations and Ambivalence," by the DAR Museum's curator of costume and textiles, Alden O'Brien, on the subject of Federal-period Americans' difficult feelings for fashion as they attempted to balance a desire for luxury with moral concerns (and also dealing with the myth of homespun). Then there is "An Elegant Assortment of Goods: Apparel Textiles of Federal-Era America," by Madelyn Shaw, which contains a lot of great information about period textiles and their manufacture. Then Ann Wass's "Regulating the Dresses of the Ladies: American Women's Fashion, 1780-1825" and Mark Hutter's "Coat Tales: Changes in the Fashion, Cut, and Construction of Men's Clothing, 1775-1830," about the transitions in fashion during this time. The essay section of the catalogue ends with "Economy with Elegance: Practices of Thrift in Fashion," by Carolyn Dowdell. The photography of the garments in the exhibition is really stunning, and it's supplemented with patterns taken by Mackenzie Anderson Sholtz (of Fig Leaf Patterns), Carolyn Dowdell, Mark Hutter, Mike McCarty, and Ike Cech of both men's and women's garments, with a nice sampling through the earlier part of the period to demonstrate the variety of fashion at the time. You can buy the catalogue in the DAR Museum's store. If you're in Canada, you should contact them directly to order it, as the automated shipping to Canada is higher than it needs to be. Thank you for the clarification! I do want to give everyone credit. Cassidy, I'm mainly interested in French-influenced European 18th century and Regency women's clothes, and I've already got Arnold, Waugh, Burnston, Percoco :-) and Costume Close-up for patterns, plus reference books on period fabrics. Do you think I will regret it if I pass on the Agreeable Tyrant, or is it a must-have for Europeans too? This is a hard question! It really is a great book/exhibition catalogue (in a lot of ways it's better than mine), but I think if you're focused on European dress it's not necessarily what you need. There are not *that* many patterns, and the essays are focused on the American situation. But I do want to reiterate again that this is a much better-looking book than mine, and the patterns came out much better (damn my imperfect hands).